Different types of documents required in Argentina to import goods? What is the certification process to import to Argentina? 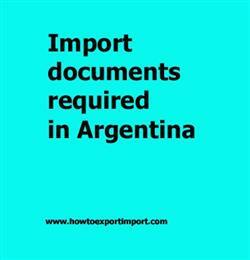 What are the documentation procedures as an importer in Argentina? Information provided here describes about documents required by each import in Argentina which need to be submitted with customs officials for the clearance process. Understanding the right export documents is essential for smooth import and export procedures. The import documents required in Argentina depends up on the nature of goods importing (General goods, Personal effects, Dangerous goods, Livestock etc.) ,regular trade policy of Argentina Government, specific goods importing to Argentina (Arms and ammunition, health products, food products, chemicals etc.). Most cases, the document requirement is depends on the country of origin or destination. This post explains about various documents that every importer need to be submitted with the Argentina Customs Authority in order to obtain clearance of the consignment. Required documents to import in Ushuaia port. Customs documentation requirements to import at BLANKA port. Import documentation in Resistencia port customs. What are the documents required to import in Resistencia. What are the import document processes need to carried out with San Carlos de Bariloche customs. Documents required to submit with BAHIA customs for importation. Which documents should I provide at MENDOZA customs port location for import. Documents need to move cargo out of customs at ROSARIO port customs location. Documentation procedures for import at BUENOS AIRES customs. What are the documents need to be submitted to import at CORDOBA port customs. Any difference between Dry port and CFS.